Are you drinking the Internet from a fire-hose? Do you try to keep track of more websites than you can remember off the top of your head? Do you feel like you’re wasting time checking to see if a website has posted anything new? If so, you can keep up with the web more effectively, instead of wasting time, by using an RSS reader. An RSS reader “aggregates” or combines information from various sites to let you know in a single glance which websites have been updated since the last time you checked. You set your RSS reader to display headlines of new posts on the websites you monitor, or to display excerpts or entire articles (if allowed by the website). With one click, you can move from the RSS reader to the original website – once you know there is something new you wish to view. Subscribe to the news websites and blogs that you wish to follow in your RSS reader. One way to subscribe to any web page is to click an orange RSS icon that appears on many pages. Here’s a video explanation of RSS “in plain English” that shows how to subscribe to your favorite news websites and blogs using Google Reader as an example. Once you become accustomed to the utility and convenience of one of these basic readers, then you can explore the countless other RSS reader apps until you find one with just that combination of features that is right for you. In addition, modern web browsers (e.g., Firefox and Safari ) directly support RSS reading in the browser as “live bookmarking,” without requiring an additional reader website. 2. Use a stand-alone RSS reader if you prefer to read offline at times; if Google’s privacy issues concern you; or if you prefer the efficiencies of a stand-alone app. Stand-alone apps can sync between various devices, so you can have your feeds with you on the go, much like a web app, so long as you own the different devices. Another potential advantage of a stand-alone reader is that it preserves the page on your desktop for access even if the website goes down or if a post is retracted, as well as when you are offline (e.g., a stand-alone reader offers a great way to catch up with websites you can’t read every day the next time you’re on a bus, train or airplane). 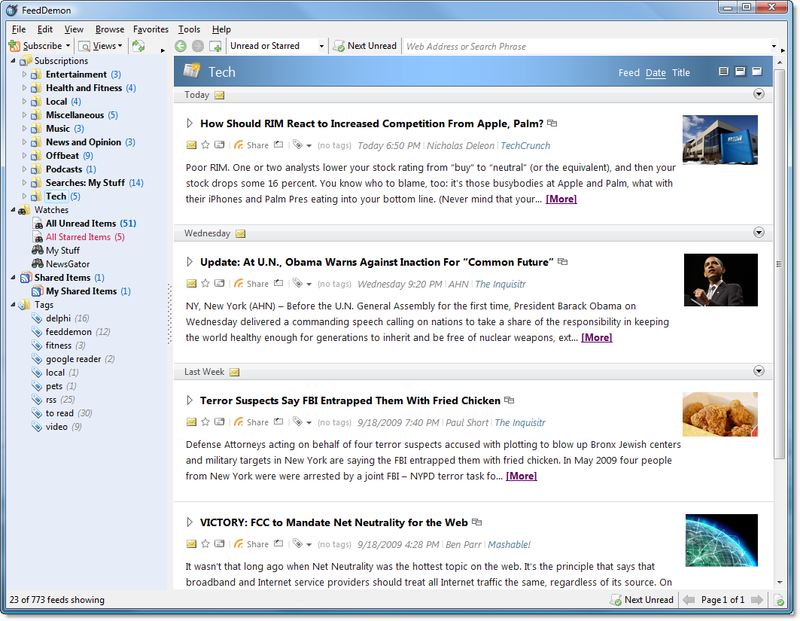 There are hundreds of stand-alone RSS readers , including FeedDemon and NetNewsWire. FeedDemon (Windows) . Screenshot below (click to view larger image). Explore the FeedDemon website for tips and instructions. The website includes a forum section and a blog. NetNewsWire (Mac, iPhone, iPad; syncs among devices) . Screenshot below (click to view larger image); see review . Explore the NetNewsWire website for tips and instructions. The website includes forums, a FAQ and a blog. To subscribe to an RSS feed for any particular website, first go to the preferences of your RSS reader or web browser to set NetNewsWire as your default RSS reader. Then go to any website to which you wish to subscribe, and click an RSS, Atom or XML button on the website. Tip: Safari identifies websites that offer an RSS feed by displaying a blue RSS icon in the address field; just click that blue RSS icon and you will automatically be subscribed to that website in NetNewsWire. Once your subscribed sites are listed in NetNewsWire, press the spacebar in NetNewsWire to jump to the next unread article. You can read it in within NetNewsWire, or press return to switch to your web browser and automatically load the article on the website.